While appraising my collection, I have come to realize “Pacific Ocean Park” has been a “Wienie” in my life. This term, coined by Walt Disney himself, refers to the function of Disneyland’s castle at the end of Main Street as “A beckoning hand that promises something worthwhile”. The beckoning hand of “Pacific Ocean Park” has called me for 40 years now and with this website I hope to get a grip! 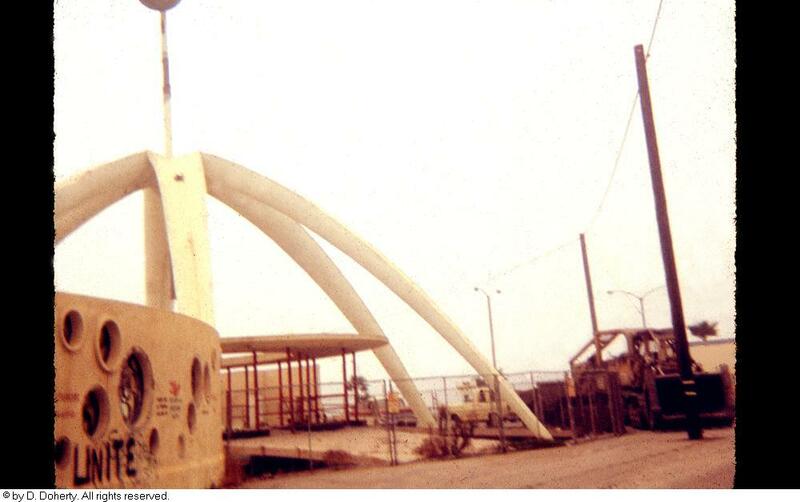 I have very few memories of physically being at “Pacific Ocean Park”, better known as “P.O.P.”, when it was “open for business”. My brother was carrying me, I was almost 1 1/2years old, we walked into a dark room with a bunch of other people, and they closed the door behind us. On the walls were these small dioramas and when I leaned forward I could see that they looked like aquariums. And on closer inspection I somehow came to the conclusion that they were filled with sinister little demon’s ! 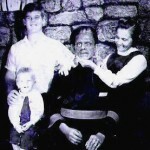 I grabbed tightly around my brothers neck – It scared me! In the course of my research on “P.O.P.” it dawned on me, this was the elevator to “Neptune’s Kingdom” at the entrance of the park. That is most of what I recall of my initial visit. 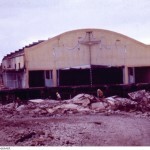 But – when “Pacific Ocean Park” was closed, and being demolished, is another story that I remember very well. 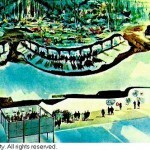 In late 1967 I would enjoy riding in the car to the L. A. airport with my parents. Not in the gleeful anticipation of greeting some incoming friend or long lost relative but because we would be passing by the very recently closed “P.O.P.” As we motored down Ocean Avenue, I would cautiously ask, or beg whoever was driving, to turn right at the appropriate corner. A question generally met with a concerned stare in the rear view mirror. This minor two-minute detour would take us down to the road that ran directly in front of it. Pressing my nose against the car window glass, or leaning dangerously from the open vehicle, holding my breath, I stared. There it was, the darkened profile of structures that thoroughly fascinated me. Each time an article appeared in the paper about “P.O.P.” I cut it out. 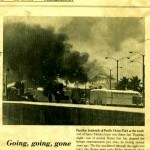 The night that the “Banana Train” ride burned down, I carefully clipped the front page announcement, with photos, and taped them inside of a folder. For lack of better materials, that folder was made from the cover of an old pad of construction paper. 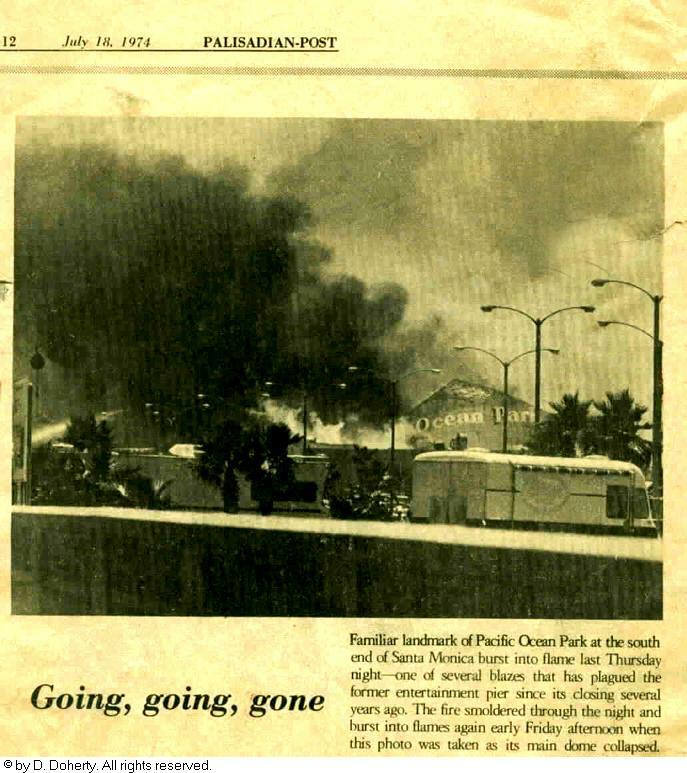 Another photo, in 1974 from the Palisades Post, entitled “Going, Going, Gone!” captured the moment just as the overpass sized “Pacific Ocean Park” sign, that covered the wall of the entrance, succumbed to a raging inferno! In lieu of the infrequent trips to the airport I could occasionally find my “P.O.P. Fix” through a movie, entitled “Carnival of Souls” that was shown on the horror program “Chiller.” The story involved a girl who has unearthly obsessions with the dilapidated old amusement pavilion that stands in the shadows off of the main highway. Except for the fact that it turns out she’s actually dead, I could and did relate. For summer weekends we would launch our behemoth Chrysler New Yorker station wagon carrying all eight of us kids, plus an occasional friend, for a ride down to the beach for the day. Generally we would go to the stretch of sand at the bottom of the “Incline” of the Pacific Coast Highway. One of these weekends, when my friend Stephen Willoughby was along, we walked to “P.O.P.” It was quite a hike down past the Santa Monica Pier, but well worth it. This was to be the first time I would really “connect” with the park on my own terms. Each sinking, sandy step my mind raced! As we got closer, this pier became much larger and grander than I could have imagined. Like a waking dream, what always appeared vague from a speeding car suddenly had great sharp pieces of detail on singular structures and walls. I can still smell the air of creosote and salt. Walking up the side of the pier and under the deck, within a chain link cage, were piles of striped material. We decided that they were circus tents being stored from some long gone occasion. 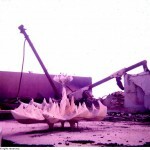 Back under the hot summer sun we navigated through rubble and the remains of the exotically themed buildings of the former “International Promenade”. Squinting through boarded up windows, I saw a huge painting of an antique camera covering a wall. 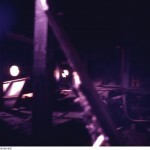 Within the chunks of concrete and bundles of rebar I suddenly heard Stephen say, “I found something!” It was a case full of eight-track tapes! 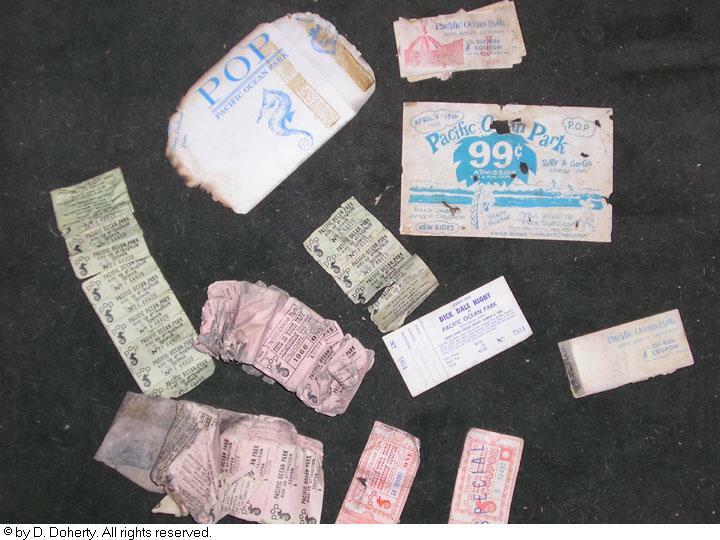 We added these to our bounty of treasure consisting of burnt handbills and tickets. A movie was being filmed, called “The Outside Man,” that day. Stephen and I watched in envy as the crew walked in and out of buildings as well as all around the park. We stood on the beach below, 11 years old. 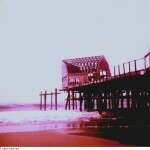 At one point the cinematographer was focusing on an actor caught in a beam of light, pouring through a hole in the pier. We began to jump around behind his subject trying to stake our place in celluloid immortality. Neither of them even flinched. I don’t think they even knew we were there. Later that night I called over to Stephen’s house and his father, famed Hollywood photographer Bob Willoughby, answered the phone. He wanted to have a “Word” with me. He was not happy. “Stay away from that place!” he spoke very adamantly. “It’s dangerous!” Apparently P.O.P. had quite a reputation for harboring some pretty seedy characters. Not to mention we were two kids climbing around a massive, demolition site of the decaying carcass of an ocean bound pier! My parents never mentioned any dangers to us about it? Of course I was one of 8 kids so, who knows? “P.O.P.” was a blazing conduit for my imagination. A “Realized” concept of the “Amusement Park in Ruins”! It was the stuff that Saturday morning episodes of “Scooby Doo”, were made of! In tribute to the day I wrote a very short story about my adventures for my school paper. It got a good laugh from my brother. Later that year I went back to the site. This time I was with a kid that I met at camp named George McGovern. And this time, we ventured further into the depths of the park than I ever had before. Dodging along the paths of broken wood and painted stucco we came across a sign for the “Sea Serpent”. Walking up the fragmented concrete queue of what had been the roller coaster, a wall of debris and rubble stopped us halfway up the path. Foregoing the barriers, as brave 12 year old boys, we tried to find an outlet that would lead to the main drag of the pier. 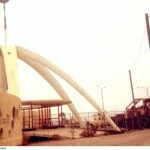 Climbing a ramp of jagged metal strands and concrete blocks I reached the summit. Success! And no sooner did I scan the beautiful breadth of the place, than a security guard appeared. He was about 100 feet ahead, and with his arms raised – he flagged us off the pier. We reluctantly complied. 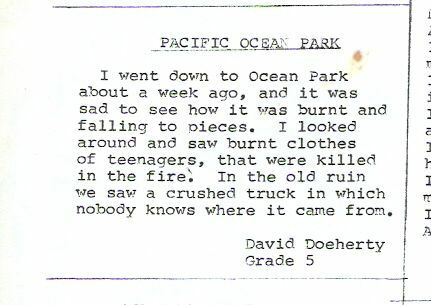 In 1974 my classmate, James Callaway, and I decided we were going to do a presentation about the history of the park for our seventh grade class. I convinced my brother Ted to drive us down there and help collect pictures for the project. 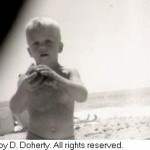 Toting a large plastic green garbage bag and an instamatic camera, we loaded into my brothers “Dasher” and headed off. 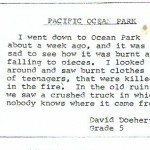 The dilapidated, fire ravaged, dangerous park, which had been closed for 8 years was our destination. And it looked like rain. We could not wait! Initially we rummaged around in the main entrance building, which had just recently burned down. 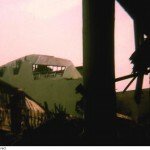 Pieces of the super-structure were still recognizable although they were thoroughly ravaged. From the abundance of paper material we surmised that this is where all the tickets and paper work had been stored. Pawing through the amusement wreckage we found lots of examples. Whole pads of tickets, vouchers, and receipts for restaurants called “The Chalet”. 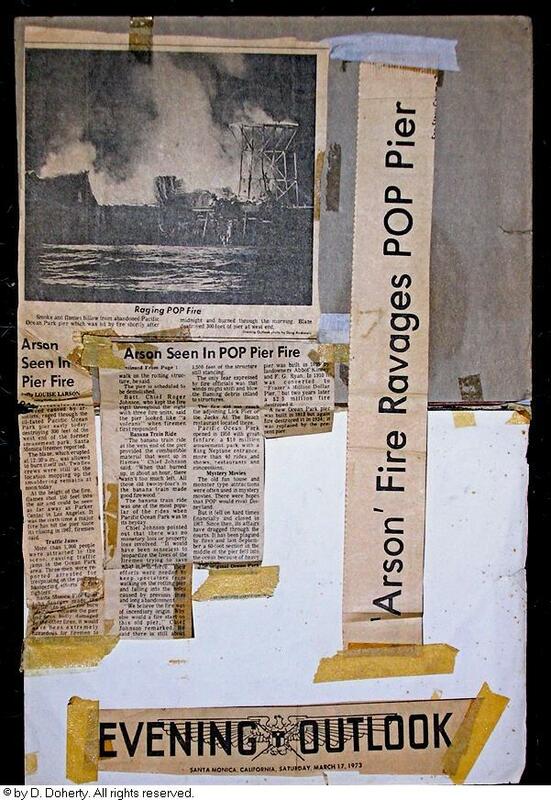 There were picture sleeves for souvenir photos with blue illustrations of Sea Horses and graphics reading “P.O.P.” They were all slightly singed and burnt around the edges. James and I each pulled off pieces of the entrance fountain. 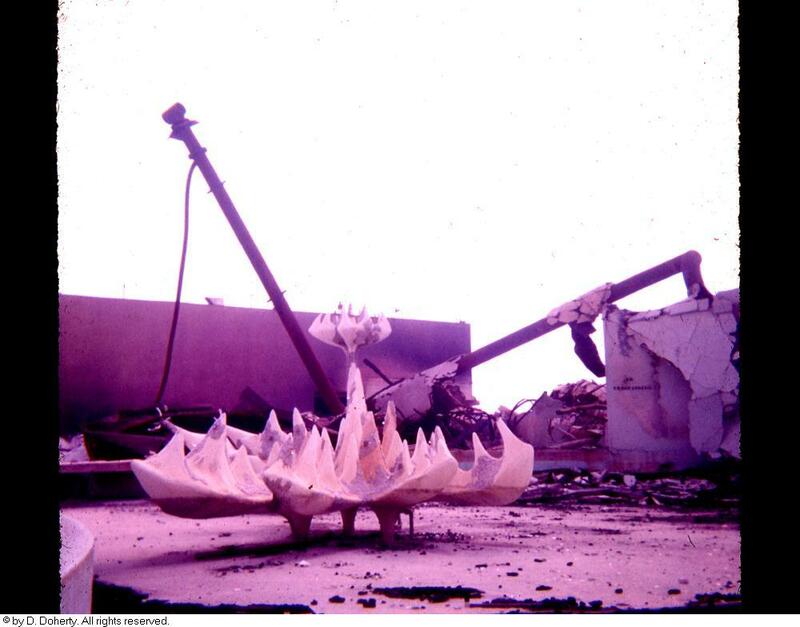 The metal mesh covered by concrete, formed into coral like shapes, were a little difficult to break loose, but we were 13 and determined. On the whole the place smelled like the fire someone set in the Charity Clothing Box at school. I did not care. I soaked it up – I was physically connecting with “P.O.P.” – I was having a great time! 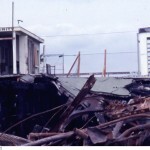 Between the “International Promenade” of buildings, at the front of the park, and the pier, as it reached out into the water, was a region of destruction. 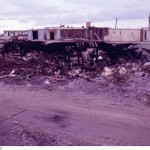 Results of the various wrecking crews that had been contracted to dismantle what hadn’t burned down of the complex. Like a path of calamity from a Godzilla movie essentially everything that had been built on the beach end of the pier was the first to go. 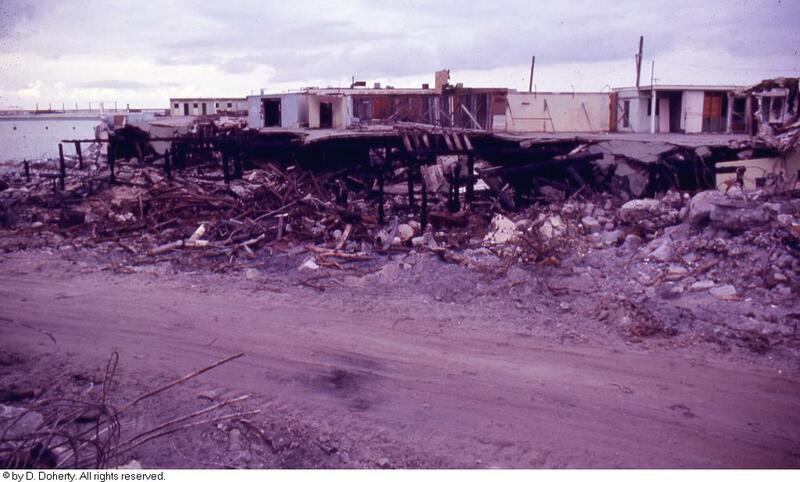 Flattened, burnt, except for an occasional colored wall it was utterly shapeless. Taking my last encounter with the security guard to heart, I did not try to get up on to the pier. I had to utilize huge holes that had been broken through the pier, which allowed me to take photos of the buildings from below. Arriving back home, with our adventurous tales, we created enthusiastic relations of these vivid, wretched, fabulous landscapes. Through this pitch we convinced my brother Joe to go back down there with us to take more pictures. He and his friend, George Symonds, had 35mm cameras and actually knew how to “photograph” something! A glaring quality difference to my 13-year-old approach to “instamatic verite!” Off we went again. Once more at the park’s entrance, we noticed the remains of the security gate kind of hanging on a ledge, the pier below it torn away by a tractor. I guess we won’t be flagged off today! A sandy road that had been cut through the site for the dump trucks invited us to pass through the ruins. Up ahead a fire truck was parked with its lights spinning and its crew standing about. I later read that a fire had supposedly “occurred, in the old shooting gallery”. Considering the condition of the site I was kind of surprised they even bothered putting it out! On the gray dusty path we stood, among what would have been the under structure of the pier. 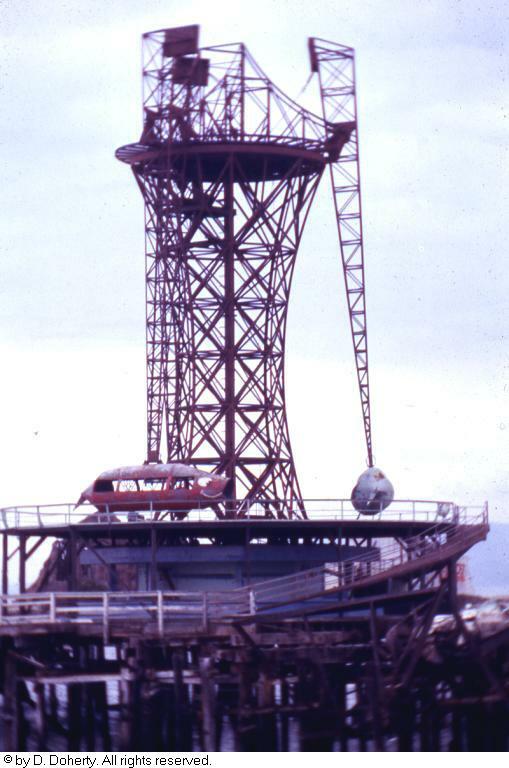 There was the “Diving Bell” tank, and half of one of the “Sea Circus” pools. The remaining portion of this big bowl stood there so pristine, as if the park had just closed recently, instead of 8 years before. It has a very surreal quality being among amusement park debris. Kind of like surveying a plane crash of clowns or circus train wreck, these structures were built to entertain you and now they threatened your life. Looking south over the sand and broken rock we could see the carousel building with its painted flags and open doors. 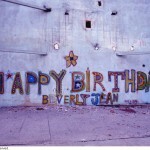 Although still festively decorated, this place looked particularly sad. All of the companion structures to its left or before it were gone. The hall seemed to know – it was next. Even the thoroughfare that ran in front of it had broken off at an angle. 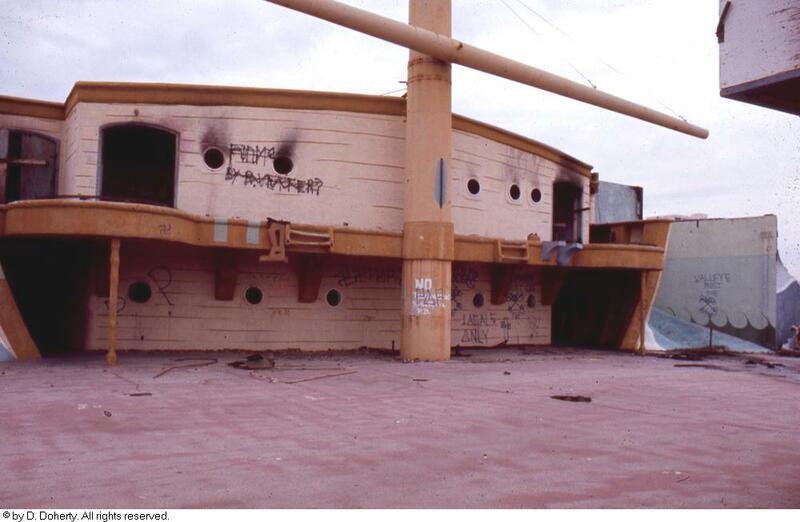 Its slanting surface graciously acted as a gangplank to gain entrance to the midway. Without hesitation my brother lead us up to the main drag. We eagerly followed. Years before this is where George and I were flagged off the pier by the security guard. Now everyone was gone. Through its open doors we entered the “Merry Go Round” room. As you can imagine it is a big barn of a space that seemed inappropriately painted deep red. Huge grooves in the floor, from the carousels undercarriage, created a great mandala at its center. On the opposite side from this hall stood the curvaceous yellow imitation of a ship. I had spied it through the pier only the week before. Now I was up close and personal with the shell of the “Flying Dutchman” ride. 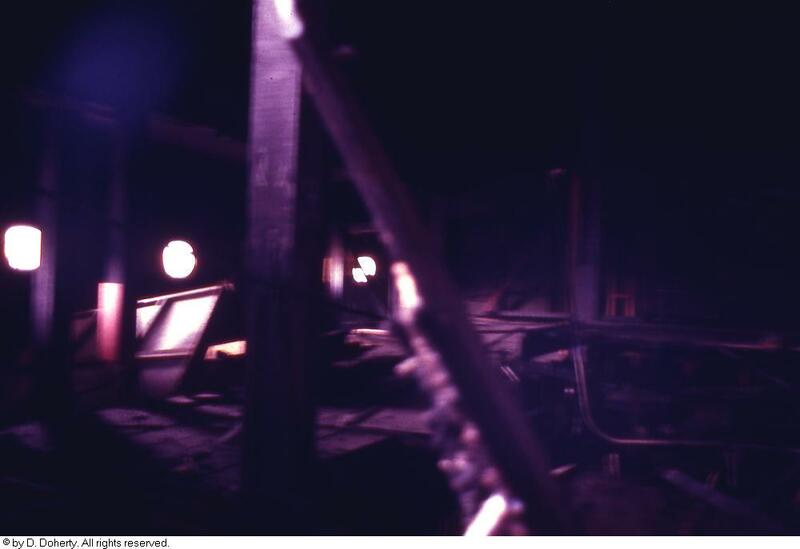 Its fire-gutted interior hardly howled of the dark ride thrills that it one time hosted. My brother got a great photo of the interior. It is one of my favorites. The light creeping through old porthole like windows into the blackened scenery. 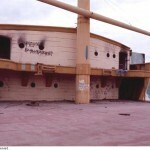 This is where the fire had been that was just put out not the shooting gallery as the paper had stated. Further down the avenue, off to the right, was the old foundation of the roller coaster. With my usual “Leap before you look” attitude I went running toward it. With a crack I was snatched by my collar and yanked backward. “Look at what you were about to step on!” Steering my eyes to the ground I observed a piece of rotted 1/4″ plywood covering a hole that dropped to the ocean about 15 feet below. What a way to go! I can also imagine an interesting phone call to my parents! My brother had saved my life. We found brightly painted murals like “Daffy Races” from the heyday of the park, as well as the work of the locals. 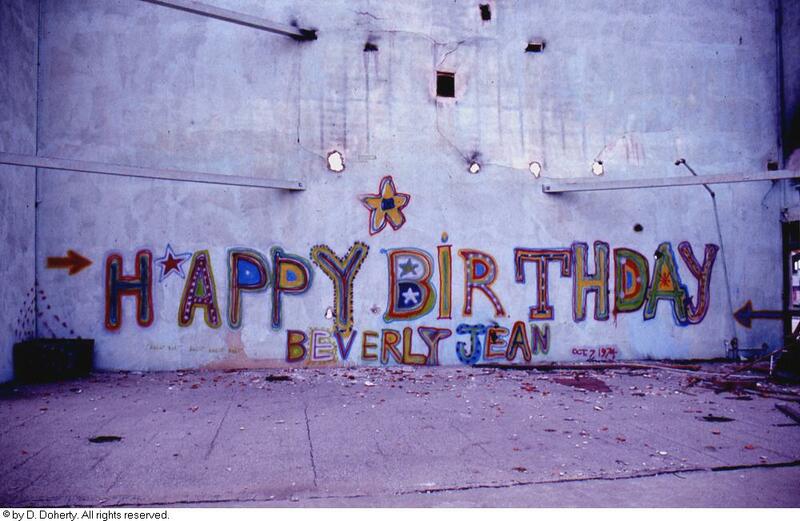 “Happy Birthday Beverly Jean” read a huge multicolored fiasco emblazoned just a few days before we got there. I could tell – it was dated. 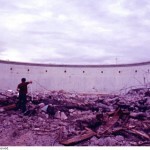 At one point I saw a large fiberglass fish head lying outside of one of the structures. Did I pick it up? Of course not! But I have a bunch of burned tickets!!! At the left side of the pier we encountered what had been styled like a New England Fisherman’s Cove. Eastern themed, chemically treated facades with aged faux stone cast panels, were crumbling around us. 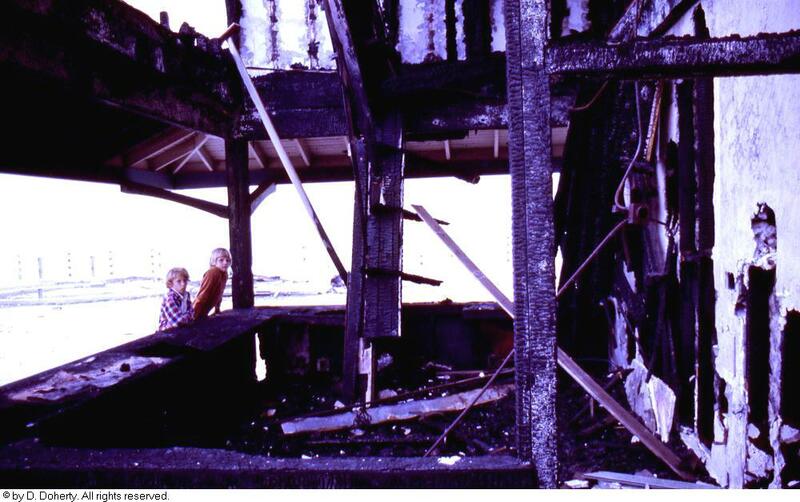 James and I posed before a counter at a fire gutted concession stand. The red barn building formerly the “Zooland POP Animal Farm” stood across the way, a heliport symbol painted on the ground in front of it. I peeked inside. 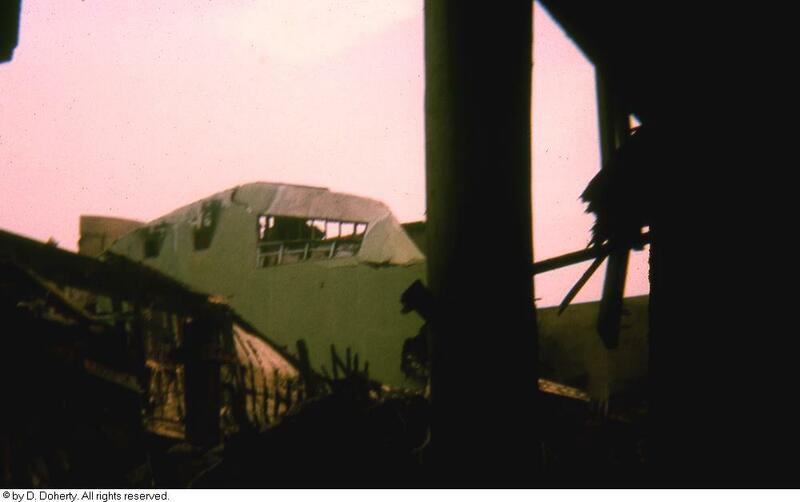 The roof was rotted, barely shingled and open to the elements. In reviewing my pictures a week later I discovered an image of this building taken from below. Another quick portal to the netherworld with its pier supports all but gone the building was practically cantilevered over the ocean! Covering this area with photos we went back out on the main drag. A few feet to the left the pier abruptly ended. The “Mystic Isle” and the “Deepest Deep” attractions had, over the years, burned down and fallen into the ocean taking huge stretches of the pier with it. 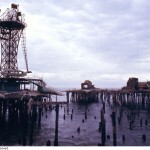 The water below was littered with burnt wood pilings and green I – beams, covered in crustaceans. The ocean resembled Neptune’s own bed of nails. With an eerie defiance the “Mahi Mahi” ride stood, all by itself, on an island out in the surf. 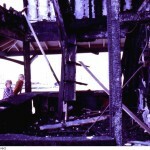 The fires that devoured the pier had mercifully isolated it. 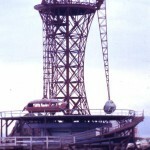 The two, of three, remaining cars were still attached to its steel red tower. Their painted porpoise like smiles bright on their bows, whipping in the wind. At what had been the piers conclusion, the only fragment of the once majestic “South Sea” island, stood a small rock cave formation that had acted as “exit” of the ride. I thought back about seeing the film crew walking into that building while it was still intact. 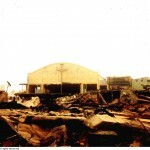 Now it resembled a lonely survivor of a Fijian flood. To recount being there that day is very peaceful for me. The pier was very solid and quiet. It was somewhat overcast, but not cold, and the sound of the ocean lulled below us. A very surreal setting. Like a dream, because I was singularly focused on where I was. I dropped the slides off at Mayfair Market for developing and was crazed until I got them back. James and I, in the meantime, sorted out our piles of burnt debris with the glee generally associated with the separation of candy at Halloween. My brother had just purchased the new “Cheech and Chong Wedding Album” and we sat on the floor listening to it – two 13 year olds and a pile of burnt theme park carnage. We bartered like thieves for the rarer items. One particularly odd artifact that we had found was fragments of a plaster statue of a genie . With its turban top and baggy panted middle-eastern attire, we glued it back together. Most of the parts were there with its hands behind its back, except the face, “someone must have taken that part” we figured. A friend at school, named Anthony Allen, mentioned that an “old actor” had moved in next door to his home in Malibu. He offered to ask this neighbor to narrate our presentation for us. Well, Anthony asked him and the man agreed! The “old actor” turned out to be Paul Henreid former star of films like “Casablanca” and “Now Voyager”. We had no idea who he was at that time. Finally! I got the slides back! Opening the package at the counter, my hands shook so the slides seemed to explode from the box! There it was, the place that haunted me!!! Showing the slides to my brother he was shocked that I hadn’t had the slides an hour and I already had gotten fingerprints on them. I couldn’t help it! Now I could actually look at it from the comfort of my own room. It was all coming together, when, as projects have a habit of doing, we lost steam. The year ended without the presentation or the slides being shown. As the weeks wound up our entire class went on a field trip to the “Los Angeles Police Academy”. For lunch, the bus shuttled us down to the beach, oddly enough, right next to “P.O.P.”! The body was still there, like a big dead whale languishing in the sand. James and I took the opportunity to sit in a circle of my fellow students and relate the history of the pier to them, using the best of visual aides – the real thing! Of all my interests, throughout my life, this one has undoubtedly held me the longest. Aside from my pursuit of artifacts from “P.O.P.”, I feel that this fascination has led me to a 15-year career in the design and creation of theme parks. 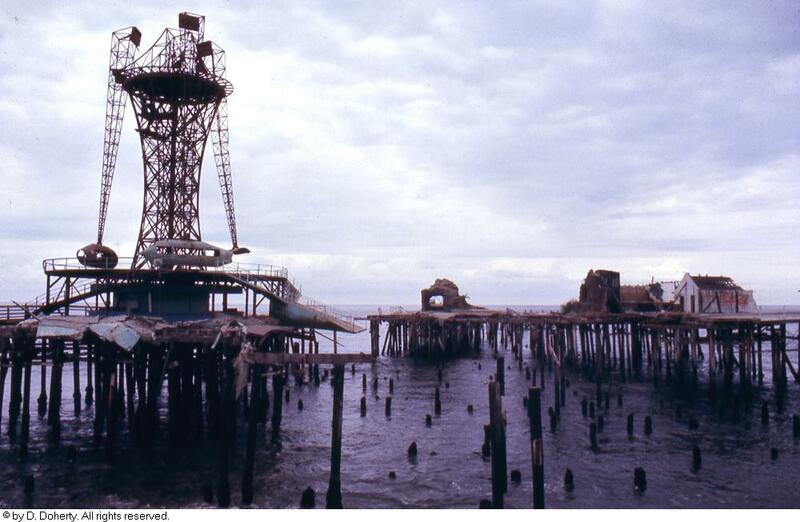 Where I came in contact with other “fans”, and actual designers of this long gone pleasure pier. 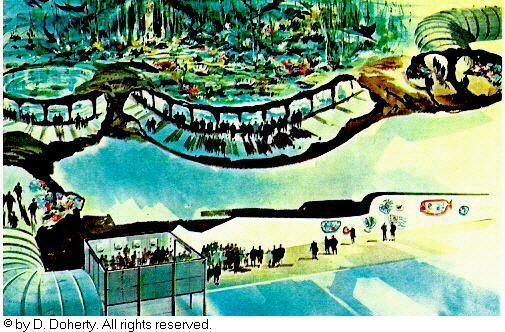 They generally concur that “P.O.P.” was an influence that drew them to a vocation in theme park design as well! Via the internet I became aware of the “Dogtown and Z-Boys” phenomenon. Their appreciation and tradition regarding “P.O.P.” bring another, very important dimension to its story. Their presence also assures me that I wasn’t the only one that the hand beckoned! 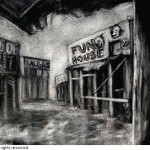 My memories have served as subject matter for stories and artwork ever since. 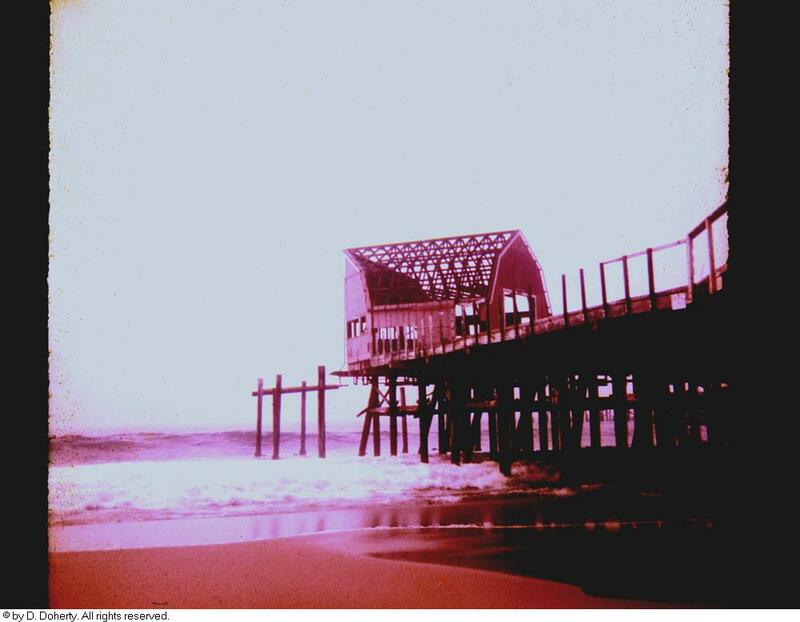 Visuals like the “burned away pier” have also played a frightening role in a nightmare. Standing at the door of an old “Fun House”. 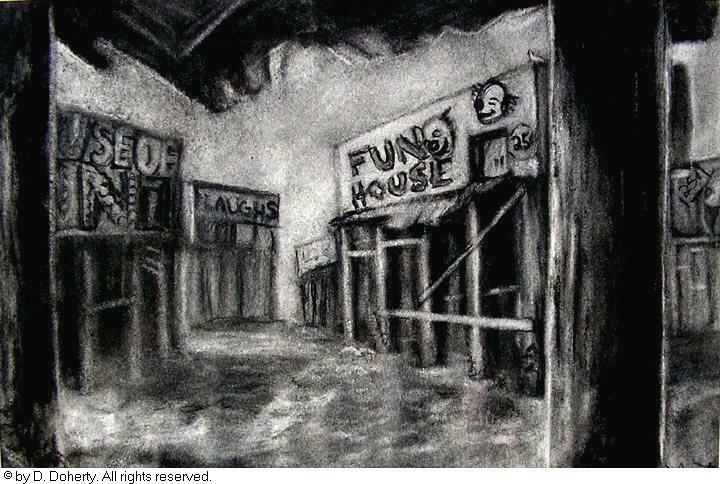 In turning to leave, I realize that all of the buildings are “Fun Houses”. And they are all standing on stilts or pilings, singularly in the ocean, with no form of bridge or connection. All trapped by the ominous rolling water, far below. 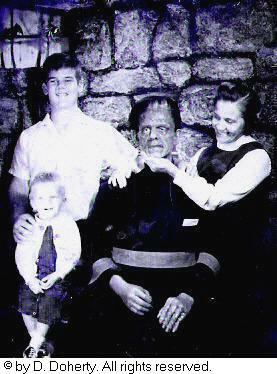 Due to haunting visions, such as these, I have since ceased to pursue my theme park career. Recently, I went back to the anonymous stretch where “P.O.P.” once lived. I sat in the sand, drawing in my sketchbook, meditating silently on the beach. The daily crowds of enthusiasts are walking, or running along, dodging the waves and birds. Up on the path they ride bicycles and rollerblade. I could not help but think that just 40 years before they could have had a futuristic styled “Trip to Mars”! Visited “Neptune’s Kingdom”, actually flown on a “Flying Carpet” and plunged to the depths in the “Diving Bell”! All in the same place – for one low price! 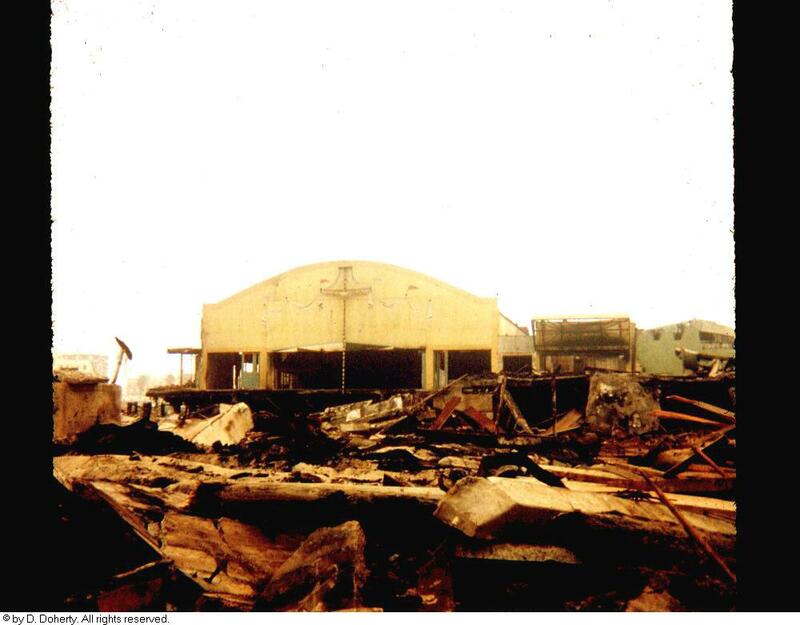 Even if they had only been there 30 years ago, only to be able to visit the half demolished, charred and splintered remains of these attractions, for “Free” like I did. The effect was equally stimulating, in a different way. Having created this site, I understand now why “P.O.P” has meant so much to me. My only encounter with it, when it was “Open”, are from a time just prior to my brother Johnny, who is mentally handicapped, being born. After that everything changed. My parents, who were juggling eight brown bag lunches daily, annual membership in the “Los Angeles Bluebook” and going to church every Sunday, became alcoholics. 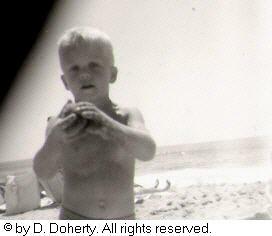 While many of my six brothers and sisters, were infrequently home. So the game of “keeping an eye on Johnny” fell primarily to me for the next 10 years. At that point he was sent to an institution in Santa Barbara. Both of my parents suddenly “passed away” in the early 1980’s. I have since left Los Angeles. And Johnny just turned 50 years old! 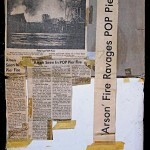 “POP” was my holding onto a memory of a time that I thought I wanted to go back to. But now that everything has settled, and I am more focused, I think I can go back there to remember, and not to wonder, any more. In July 2014 a book that Christopher Merritt and I started working on 13 years ago about the history of the park has been published. I contributed a lot of research to this book including clippings, recordings, photos and interviews that I had collected over the years. I feel extremely fortunate to have witnessed this phenomenon and been able to share these memories. It was a great catharsis of this obsession. Now, its gotten to the point that I rarely even think about it. 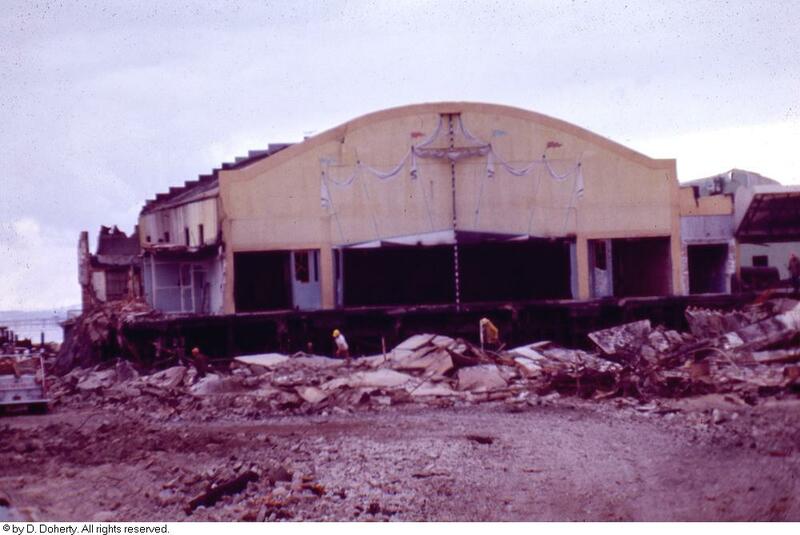 Rest in peace “Pacific Ocean Park”.